Harry graduated from the University of Liverpool. Whilst working in small animal practice and for animal charities (PDSA and RSPCA) he developed interests in both orthopaedics and dermatology culminating in RCVS Certificates in both disciplines. Harry became a Fellow of the Royal College of Veterinary Surgeons by examination in Canine Spinal Surgery in 1992, and in 1999 he obtained the RCVS Diploma in Small Animal Surgery (Orthopaedics). He is a Certified Canine Rehabilitation Practitioner (CCRP) awarded by the university of Tennessee. Harry was awarded his European Diploma in Veterinary Neurology in 2016. 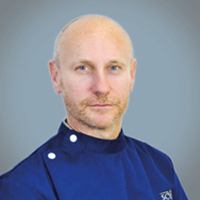 His interests include all aspects of orthopaedics and advanced neurosurgical procedures.